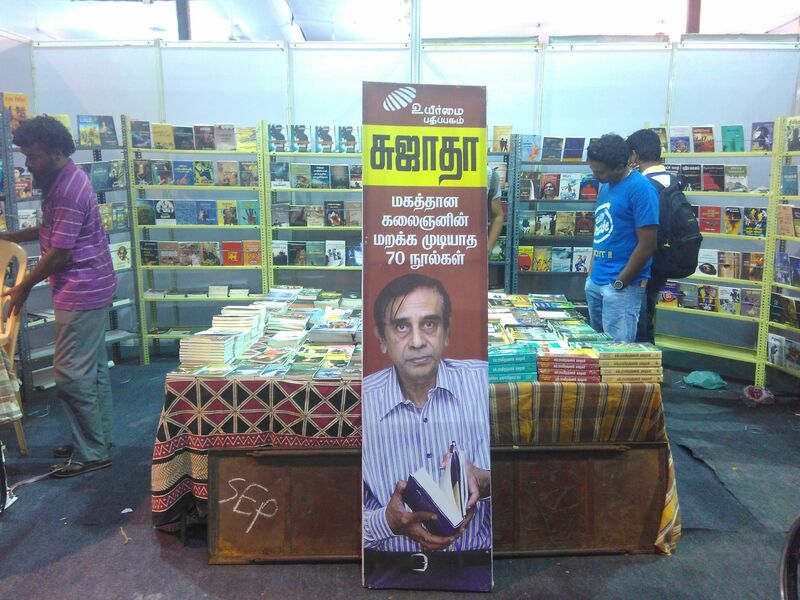 Update: The annual Chennai Book Fair 2016 organized by BAPASI was cancelled in January due to floods. 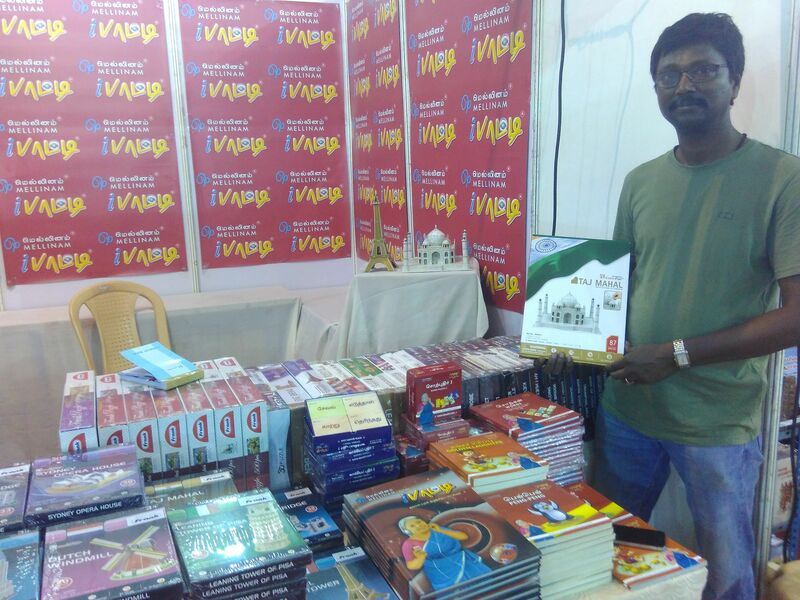 Now, they have announced that the book event will be held from June 01 – June 13, 2016 @ Island Grounds, Chennai. 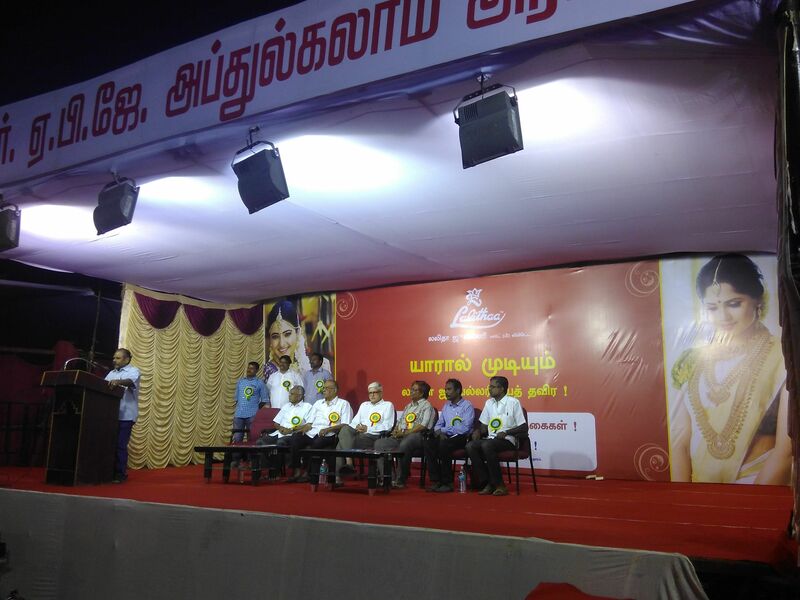 The Chennai Pongal Book Festival 2016 is being held at the YMCA Grounds, Royapettah (Not Nandanam) from January 13 – 24, ’16. 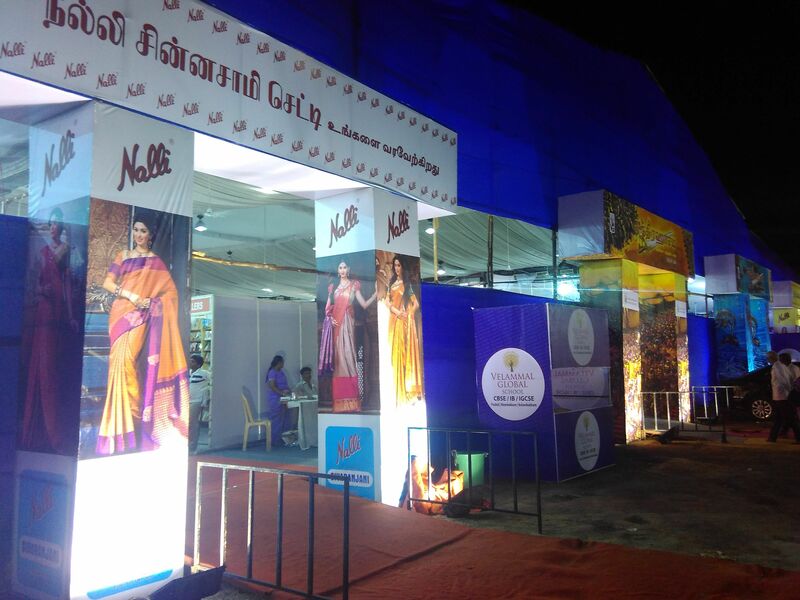 This சென்னை பொங்கல் 2016 புத்தக கண்காட்சி has been organized by தமிழ் நூல் விற்பனை வெளியீட்டு மேம்பாடு கழகம். It’s open for public from 2 P.M. to 8:30 P.M on normal days and 11 A.M. to 8:30 P.M. on holidays. Note: The usual BAPASI book fair has been postponed to Apr. this year. Location: Opp. to Royapettah General Hosptial. YMCA Royapettah is located at the intersection of Peters Road, Westcott Road & Royapettah High Road. Google Maps link. The opening ceremony was held yesterday – Wed, Jan. 13. It was presided over by Justice Chandru, Former Governor of West Bengal – Gopala Krishna Gandhi, Muthukumaraswamy, and others. The speakers prominently mentioned that more than the floods, silencing of literary voices and banning of literary works over the last one year affected them heavily. 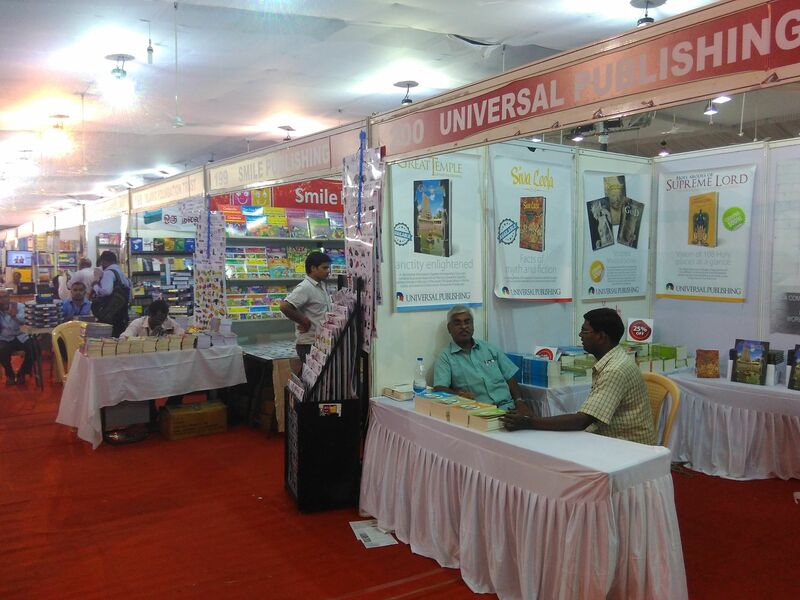 Around 200 stalls and book sellers are participating in this book fair. The entrance ticket is Rs. 5/-, but the organizers say that proceeds from the entrance ticket sales will be donated to Flood Relief Fund. They also mentioned that the book sellers have come forward to donate 3000 books to the Ashok Nagar public library as it has lost most of its books due to floods. I came across many interesting stalls and promotions, I will mention a few here. 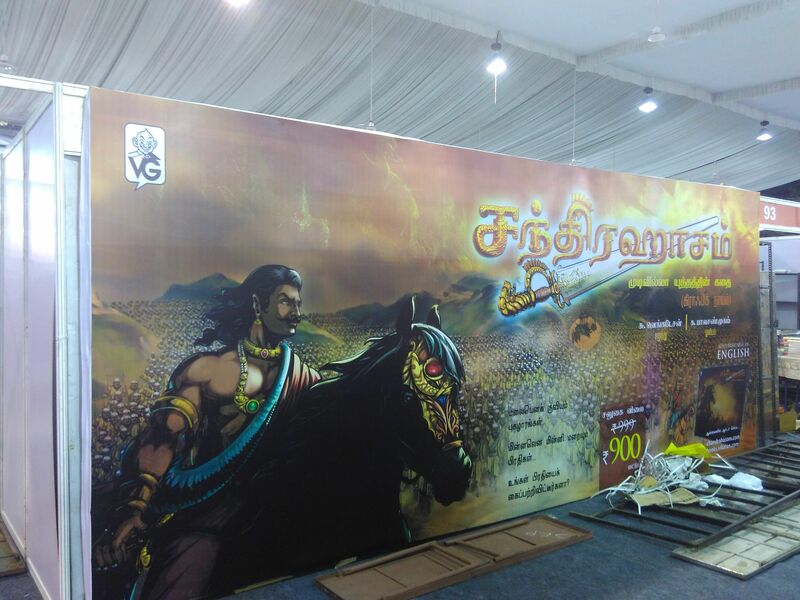 The Vikadan group’s promotional stall and banners for Chandrahasam caught my eye prominently. 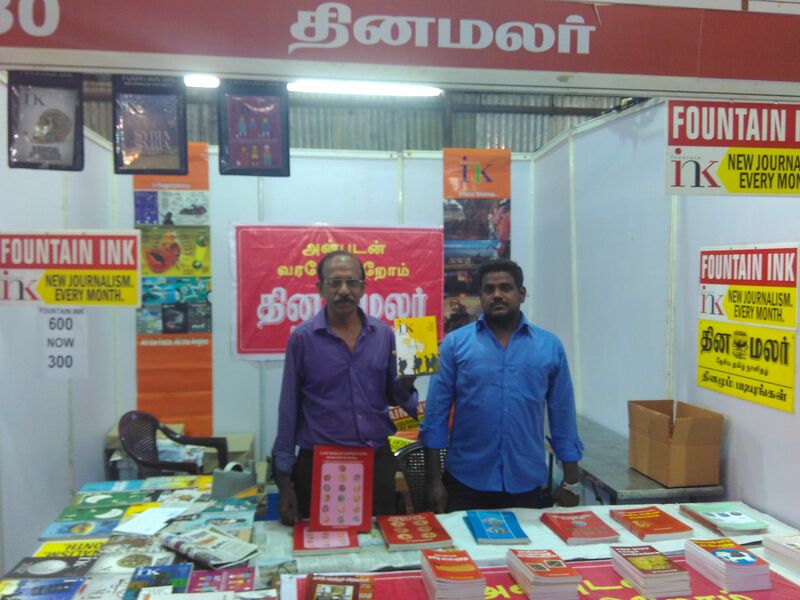 The Thina Malar staff are promoting the annual subscription to their monthly English Magazine – Fountain Ink, which according to them, features stories that are generally not reported by the mainstream media. This magazine is available across India. 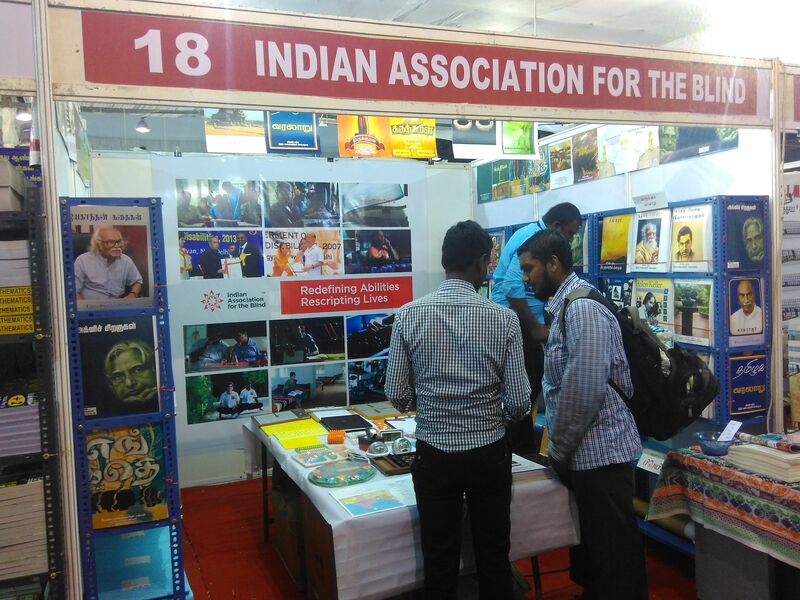 The Indian association for the blind has displayed their Braille books (fiction and non-fiction) and other literary aids for the visually impaired. Amogha Enterprises are promoting their 3D models of major monuments that can be assembled from scratch by hands. Do you see the cardboard displays of assembed Taj Mahal and Eiffel Tower models, at the back? I should also mention about the healthy eatery (within the book fair complex): Devaamritham. They are serving millet based ladoos, cakes, pakoda, etc. And also Aavarampoo Theneer and Sukkumilagu Coffee. Check it out! For bikes and cars there is a parking fee of Rs. 10 and Rs. 30 for three hours. I am so jealous of you DI! I wish I could attend this fair 🙁 Did you buy any books? Yes I bought a few books and few magazines. But nothing considerable since I read more eBooks and listen to more audio books, nowadays. Usual I used to send my father to get me the books from the book fair, but for last few years I prefer flipkart. I have seen book fairs used to be crowded, but the situation this time seem to be dull. The assembly of monuments sound cool! I hope more people visit book fairs now and in the future. I don’t have a comprehensive list. Yes, that book looks interesting. But it’s somewhat expensive though! I so look forward to such book fairs. Missed the one that was organised in Jaipur this year. Weren’t there stalls for popular fiction which you get either in kilos or Rs 20 to Rs 50 or Rs 100 per book? I have bought some amazing books at throwaway prices at these book fairs. That concept of buying books in kilos has not caught up here, yet. But there are second-hand bookshops outside that sell books cheaply. Please can anybody tell me, whether cards acceptable here in the book stalls? Yes, I saw bookstalls accepting cards. But I am not sure if all the bookstalls accept credit cards. Please can anybody tell me, whether cards acceptable for payment here in the book stalls? that Nali advertisement took me down the memory lane… I love going to book fares … it’s like a paradise for booklovers. Where’s your loot? 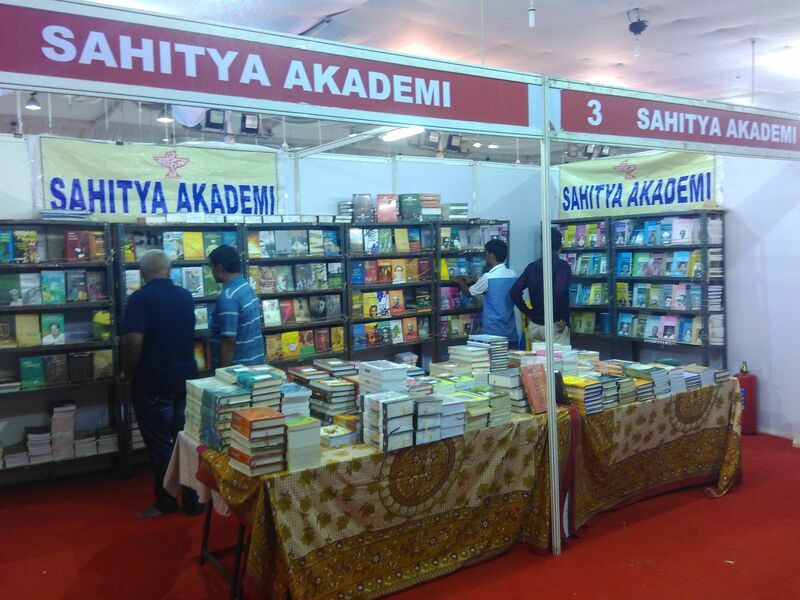 I was glad to know about this book fair, because April seems a distant away for now. Though we get books for cheap prices at Flipkart or Amazon, nothing could beat the feel of going through racks and racks of neatly arranged books! Could you please let me know when will be start next book fair for this year ?